I had the privilege of representing Stark at the Luxury Retail Summit in NYC yesterday and was able to inform attendees of what I am doing at Stark to protect our relationships with designs while expanding our business to include retail as well. Check out the below post from Luxury Daily‘s blog summarizing my presentation. Also, check out a quick video clip at the end on me speaking about how Ecommerce will help our business! 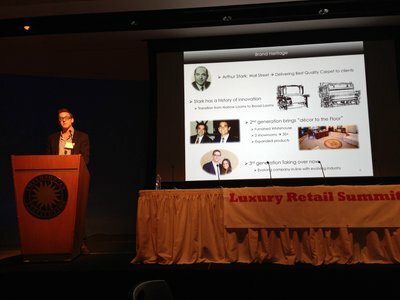 NEW YORK – A Stark Carpet executive at the Luxury Retail Summit: Holiday Focus 2013 yesterday discussed the lessons that the company learned while transitioning from trade-only to a retail trade combination. During the “Stark: Evolving a Luxury Floor Coverings Brand from Trade-only Business to Retail” session, the executive discussed the challenges the company faced and how Stark readjusted its business model to accommodate both trade and retail without compromising its brand DNA and relations with interior designers. Exploring various methods can allow a brand to better adapt to a new market sector. “Understanding the role of interior designers is vital to Stark,” said Chad Stark, vice president of operations and technology at Stark Carpet, New York. Luxury Daily organized the Luxury Retail Summit: Holiday Focus 2013. Mr. Stark shared the brand’s challenges and lessons learned subsequently. The Internet created design enthusiasts who had wide access to free design materials when previously this was left to a knowledgeable interior designer. Between Web sites and design magazines, retail consumers are more informed than ever and many circumvent the advice and assistance of interior designers. For Stark it was important not to tarnish its relationship with interior designers who had helped to elevate the brand to its standing as the leader in luxury floor coverings. The new generation of consumers is less about touch and feel and is less inclined to travel far distances to experience a product first hand before making a purchase. With a willingness to purchase online rather than in bricks-and-mortar locations, the new generation of Stark consumers prefer the accessibility of ecommerce. Stark discovered that this new generation is much more price-sensitive than previous groups of consumers. The Internet and their increased knowledge led to consumers visiting showrooms without a designer in an attempt to buy products directly. To accommodate the growing number of informed and price conscious consumers, Stark held warehouse clearance sales every two years in different markets to sell its overstocked products. Stark discovered that although the warehouse was successful from a consumer standpoint, interior designers pushed back at first. Overtime, interior designers began to bring clients to the warehouse sales. Next, Stark developed retail outlets with a trade showroom within the same bricks-and-mortar location. The trade showroom was closed off to retail consumers, but the rest of the location was designed with a scaled-down warehouse format. This concept damaged Stark because the brand featured its high-end exclusive products next to closeout items. From this model, Stark was able to re-envision its retail outposts in the form of Stark Home. The Stark Home model replicated the exclusive nature of its trade showrooms but created a retail atmosphere as well. In theory, the Norwalk, CT, location was meant to amplify the New York showroom, but designers felt consumers were able to obtain Stark products without their assistance after visiting the showroom. Stark, valuing the continued support of interior designers, sought out designers circumvented by consumers and compensated their time. Ecommerce gave Stark significant exposure through flash sales with Web sites such as One Kings Lane, Gilt and Rue La La. Although sales and exposure were successful, the flash sales ruined the exclusive nature of its products while confusing design industry. In 2014, Stark plans to re-launch its ecommerce site to increase convenience for trade and retail consumers. Today, Stark showrooms are rooted in experience. The showrooms carry carpets and fabrics, as well as “cash & carry” area rugs in a combined trade and retail space. To inform retail consumers about Stark, products are accompanied by relevant information allowing for more engagement. Although the trade area is only shoppable by interior designers, retail consumers are welcome to browse the area. If a product strikes them, Stark suggests a local designer to assist with the project. The “to-the-trade” program highlights interior designers as partners since their continued patronage has ensured the integrity of Stark. The program includes signature exclusive products for trade professionals such as Stark’s collaboration with fashion label Missoni, additional discounts online and in-store, and special services such a custom product development and home consultation. Starks trials and tribulations during its adaptations from trade-only to retail is bound to affect the industry as a whole. “Stark is the only luxury flooring brand and we take risks for the benefit of the industry,” Mr. Stark said. “It is a scary and thrilling position to be in,” he said. “The industry is changing and the way interior designers work with clients is changing.